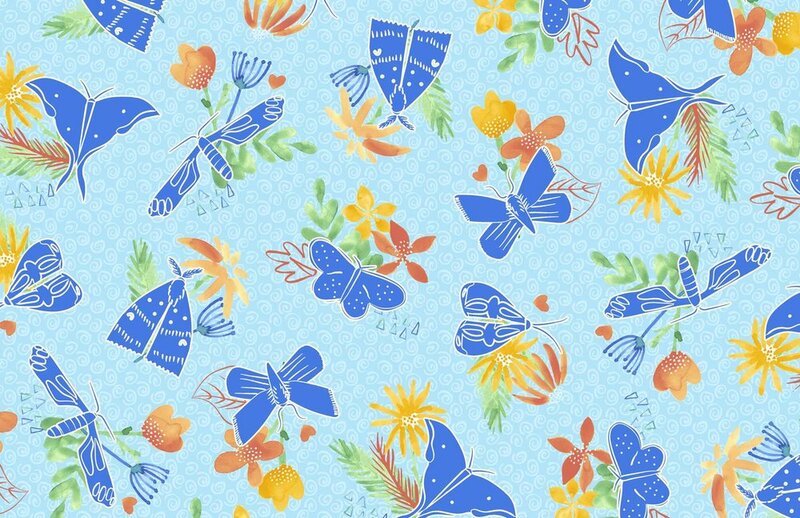 I've been participating in the Spoonflower challenges of late - not to win (though that'd be great! ), but for topical inspiration. I pick and choose, of course, based on what I'll think will work in a few markets, then create! This past week was the theme Yarn. I chose to do a fun twist and make some wall-hangings...you know, those super cool DIY ones you see all over Pinterest (or..maybe I'M only seeing them...Drat!). You can vote for the main wall hanging pattern, too, on Spoonflower (until Jan 11). The color palette was new for me and I really enjoyed it! I tend to go for saturated colors, but toning it down a bit and working with a dark background, too, was a great new direction. A little side note: I shortened the Tolkien quote because I didn't want it to look lopsided, but it still retains its meaning and feeling. PLUS, I had mentioned this on Instagram, but I've been working with digital painting over the past month or so. I had done it before, but without real seriousness, but I'm kind of loving it now. I don't use an iPad or a fancy Cintiq (but I'd love one, thanks! )...just my trusty Wacom Intuos tablet. While I can see the benefit of the other hardware, I'm really used to my little desk tablet, and am glad I started using one forever ago. I'm always for starting the hard way, THEN learning an easier way later. Just like walking to school, up hill, both ways. Don't worry, my paints won't dry out...I'm just experimenting with other ways of creating. We are likely moving across the country (literally coast to coast) within the next 3 months and I wanted to try out other methods in case I can't bust out my paint sets (plus the water, paper towels, etc) while on the road. Besides, my cat can get into less trouble with the computer than she can with a paint set ;). If you're interested in licensing any of these designs, shoot me an email! I'm exhibiting at BLUEPRINT, make an appointment and say hi! Been working on this collection for almost a month -- it's a personal one that got interrupted for a few weeks while I did client projects. While real-life baby elephants may have googly eyes and are quite furry, it's still fun to play up their cute-ness! and we can talk about licensing or buying. There's a ton of color options in this collection no shown on the collection page. Below are just a few more. 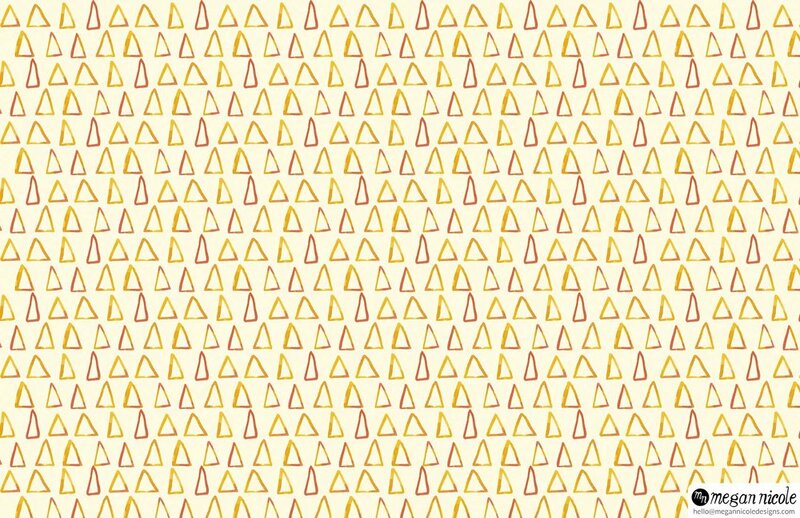 There are about 3-4 colorways for each pattern when you see the whole grouping. I'm so excited about this collection, I don't know where to start...so here it is! Sometimes I feel like I was born in the wrong century. The clothes and romanticized notions we've come to know about the Renaissance is just SO beautiful...and the state of mind around then seemed simple and centered around close groups of people. In reality, I know that it would have been extremely difficult to live back then knowing what we know now. ...But I just had to capture a little light-hearted bit of that time. I called this collection Forest Faire, using ye olde spelling of fair since that suited my theme of an entertaining gathering in the woods. And what better motifs to use than woodland creatures?! I thought so! My favorite is the fortune-teller -- she was my initial idea for this collection and I just love how she turned out! The patterns I'm showing you here are just a sampling of the colorways and sparse hints of the entire patterns that I've developed for this, so if you're interested, please contact me and we can talk! Way back in January, I worked on these peppers. Originally, they were done with watercolor and I mixed it with some vector line-work. I felt I wanted to update them a little because I wasn't entirely pleased with the water color look for these. Practicing with watercolor has been something I've been doing in my free-time away from the computer and I want to learn more and keep working at before I incorporate it in my art. Basically: I want my best out there. I'm proud to say these make me happy now! The color palette is my favorite thing, though. I would love to see these on some kitchen linens; that pink and turq would be refreshing updates to the usual navy and red you get with some kitchen decor. If you're interested in developing these into some fun products, let me know! Get curious & sign up to get tutorials, or get news about fresh art. Select an option below and you'll get fun updates every month! A Fellow Artist: I want to learn from your tutorials & classes. An Art Director: I want to see your new available artwork for licensing/purchase. Class for Photoshop: Learn to use built-in tools that will get you back to making art and making money.